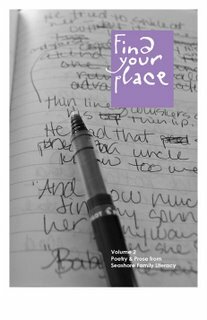 Find Your Place, a book of poetry and prose from Seashore Family Literacy, has hit bookshelves everywhere — or rather, a couple of libraries, bookstores, and kitchen counters across the central Oregon Coast. But it could be everywhere — and it could be yours! The 64-page book reflects the work and spirit of the Young Writers Group, a collection of students age 14 to 21 who enjoy writing practice with a supportive vibe. Students and adult volunteers meet every Thursday evening to write together in a place where it is safe to reveal the darker (and occasionally, lighter) side of life. I’ve been a volunteer with the Young Writers Group for nearly four years. And, I’m grateful to feel I have found my place. I like to say that “poetry saved my life,” and it’s true. But it’s this endearing group of misfits and upstarts that expanded my heart. Do you want to feed your mind, encourage young authors and celebrate the power of the writing process? Find Your Place is available for just $10. (And all proceeds go to the writing programs at Seashore Family Literacy, a nonprofit organization).